As Billy Idol once said, “It’s a nice day for a white wedding”, and with these stunningly elegant floral hoops, it’ll be an even nicer day! The fourth design of 'The Infinity Collection' is a classic, simple design consisting of white peonies, white hydrangeas and white cherry blossom. 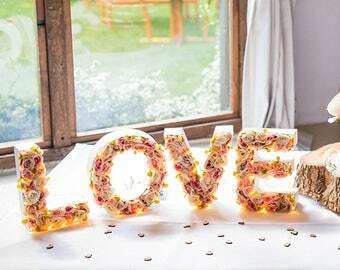 Hanging from the centre is a beautifully laser cut word (optional) which can be personalised to your request; Love, Bride, Groom, Mr, Mrs - perhaps even a name? 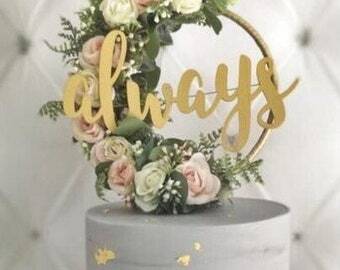 The photo shows the word sprayed in a beautiful gold to match the colour of the hoop, but you can choose from Copper, Silver or Gold - the hoop itself will have ribbon to match. • High quality silk flowers / foliage - no watering required! 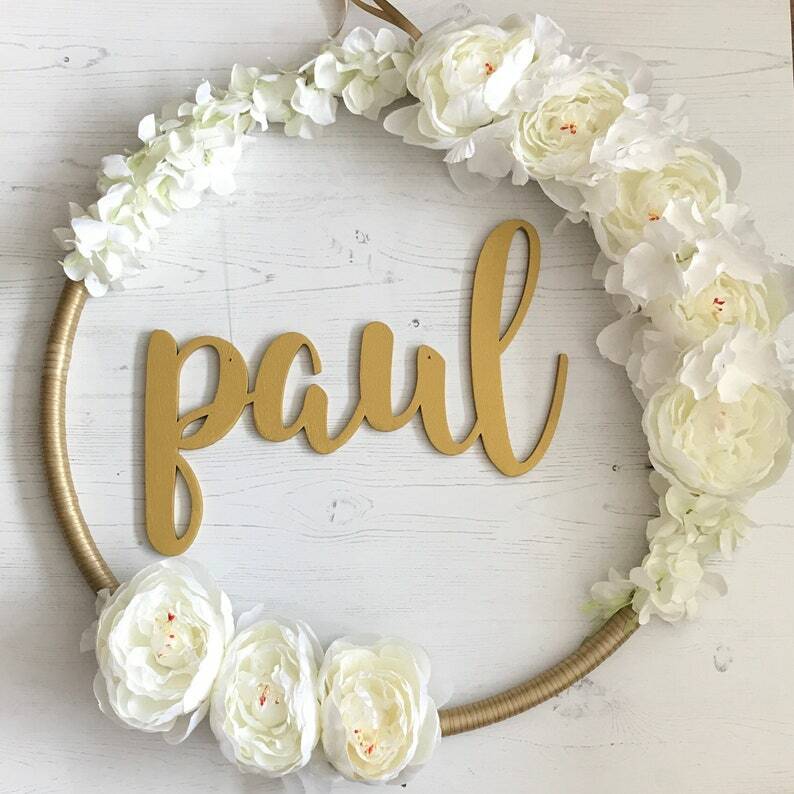 Floral hoop. Scandi hoop. Spring wreath. Bridesmaid bouquet. Bride circlet. Mother's Day Gift. Door wreath. Green. Wedding decor. This is the cutest cake topper I have ever seen! Very well put together and the lights just make it that much more unique. Couldn't love it more! I would highly recommend! So beautiful and well made! Great customer service! All orders must be placed Etsy payment system. I will not invoice outside of this. From time to time, sales may be run throughout my shop. When these happen please note, no other discounts can be applied to the order and only the discount with the highest percentage value will be applied. Please note as all items are made to order, with materials purchased as soon as orders are placed, cancellations are not accepted. If you receive your item and it is no longer required, please get in touch to discuss returning it. As long as it hasn’t been used and is in a re-saleable condition I’ll be happy to refund. Please note that until the item is safely back with me, you are responsible for it. For this reason I’d recommend returning via a tracked shipping method. You are solely responsible for the return delivery costs. I do my best to ensure that all items are packaged safely and securely however appreciate that items in transit may get knocked about / damaged. If this happens please do get in touch as within 14days of receipt and we can discuss how to resolve the matter. I will need images of the packaging plus the item in order to claim from the courier company. If your order hasn’t arrived please ensure you contact me within 14 days of receiving the shipping notification for U.K. orders (31 for international) so I can open an enquiry with the delivery company used. All LED fairy lights are guaranteed by the manufacturer for 12 months. In the unlikely event that your item develops a fault within the first 12 months, please do contact me and I will arrange a replacement to be issued. As all items are made to order, please do note the estimated shipping date on your receipt. This is the date that I work to. As I work on my own (unless you count Keith Moon and Oliver Reed (our pups)) and prt time, contact from myself may be minimal unless I have any questions. UK orders are sent via Royal Mail. Proof of postage is always obtained. Tracking shipping methods can be purchased as an upgrade. Delays in shipping times, once your items are posted, are unfortunately outside of my control. Please note that as I am now studying part time and in an effort to make more efficient use of my time, all dispatch notifications are sent at the end of the week your item is due out. As all items are made to order, please do note the estimated shipping date on your receipt. This is the date that I work to. All international orders are sent via standard local post. Shipping upgrades are available upon checkout. Non-tracked shipping times for overseas countries will vary depending on customs and destination but will vary between 7 - 22 working days. Please note at busy times (holidays, Black Friday etc) it may be longer. Shipping upgrades are available at checkout. Any import charges are the sole responsibility of yourselves. I do not cover these fees in my postage costs. Delays during shipping are unfortunately outside of my control and although I will do my best to resolve the situation, I cannot be held responsible for issues once your item is passed over to the courier. Should your item become lost / damaged during transit, I can offer a replacement (if time allows). Please do contact me ASAP if your item hasn't arrived. When you place an order you are accepting these conditions. Handmade reinforced Paper mache letter lights are 17.5cm tall. At this time, this is the only size light I make. Cake topper letters are 10cm tall. The width will vary per character. Please note that due to the size of these letters, it is recommended that the minimum size cake tier is 8inches. Please do note that each item is made to order, by me, Vikki, and production time varies from 3 - 5 weeks depending on the item / time of year. Shipping is on top of this production timeframe, so if your item is required for a specific date, please do select the appropriate shipping option. From time to time, I may be able to fast track your order. Please contact me first to discuss your requirements. Please note, multiple items will take longer to produce than the estimated delivery date. Please get in touch for a more accurate delivery timescale. Please note that as I work part time, all orders are shipped on a Saturday . UK shipping times are approx 5 working days. Faster, tracked options can be purchased as an upgrade. For overseas orders I offer a standard economy service or tracked shipping upgrades if chosen. The economy service can take up to 21+ business days to arrive depending on where you are in the world. The economy option is not trackable but proof of postage is always obtained. What are the shipping times like? UK shipping times are approx 5 working days, unless you have purchased a faster shipping upgrade. Shipping times overseas vary depending on location however you should expect to receive your order within 45 days of dispatch. If you need your item quicker or would like it trackable, shipping upgrades are available on checkout. Please note I'm afraid once shipped, I cannot be held responsible for delays in transit. Please also note that as I’m now studying part time and in an attempt to be more time efficient and not work at the weekends, all my Etsy ‘admin’ (dispatch notifications etc) is usually completed at the end of the week your order is dispatched / the Monday of the following week. Great... how do I order? Before ordering please ensure you've read the full item description and have checked the shipping times. Please note due to the fact that I work alone and part time, orders are tackled in the order that they are placed and as a result I unfortunately cannot accommodate rushed orders, so please do check lead times plus shipping info to ensure that your order will reach you on time. I unfortunately can not be held responsible for items that don’t arrive in time if the event takes place before the estimated shipping date. Once orders are placed, contact from me may be minimal unless I have any questions regarding your order. Eeek... I need my order sooner! I totally appreciate that when planning your wedding things can often be left to the last minute, and in these cases I will do my best to accommodate last minute requests. Just please make sure you message me to discuss your requirements before placing an order so I can see if I can fit you in. Please do note if I am able to squeeze you in, that your order will arrive the week of your wedding / event, as I’m unable to shuffle orders around due to the impact it would have on my other customers. All lights are guaranteed for 365 days from the date of dispatch. If your light develops a fault within this period please do get in touch and I can arrange a replacement to be made for you. I need to get in touch. What are your working hours? Please note that I run The White Bulb alongside my other part time job, therefore after your order is placed, communication from me may be minimal unless I have any questions. During the week, please allow 24hours for me to reply on a week day. I answer all emails Mon - Thurs generally between 6-7pm GMT. Emails sent on a Friday, over the weekend or during holidays may take longer for me to reply to.